Successfully Added OUKITEL U7 Pro Smartphone - 5.5 Inch IPS Screen, Quad Core CPU, 1GB RAM, Dual SIM, Android 5.1, Smart Wake (Grey) to your Shopping Cart. Smart Wake and Gesture Sensing brings a new dimension to your Smartphone interactions. OUKITEL have been delving great phones at almost unbeatable prices and their latest is no different. The OUKITEL U7 Pro comes with a large 5.5 inch screen, Quad Core CPU, Android 5.1 OS, Smart wake, Gesture control and HotKnot. Fantastic value for under $70 as OUKITEL bring great bang for your buck. The HD 5.5 inch screen offers superb viewing for all your games and movies and the IPS technology ensures a wider viewing angle so you can share the fun with friends as you wont experience any washout images when viewing the screen from wider angles. There is a nice depth of color and great brightness so you get a lush vibrant image on the OUKITEL U7 Pro. The reliable performance from his phone is down to a Quad Core MTK CPU running alongside 1GB or RAM. When paired with the Mali 400 GPU and managed by the proficient Android 5.1 OS it hums along nicely running games and playing media in fantastic quality. With 8GB of onboard storage and a micro SD slot offering up to 32GB of additional space there’s more than enough room for your music library, games and other media. The OKUTEL U7 Pro offers great user interactions as it comes with smart wake and gesture sensing controls that offer efficient ways to access your favorite apps and navigate the phones functions. Simply draw a character on the locked screen to open the preset app or flip through music and music tracks at the wave of a hand. 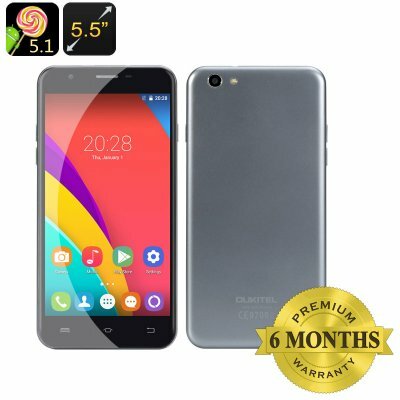 The OUKITEL U7 Pro Smartphone comes with 12 months warranty, brought to you by the leader in electronic devices as well as wholesale Android Cell Phones..